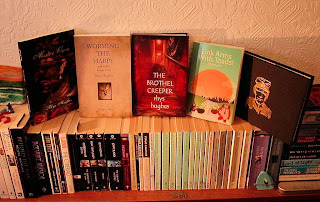 From left to right my five books are: (a) Mister Gum, an obscene satirical novel, 2nd edition, (b) Worming the Harpy, definitive version, (c) The Brothel Creeper, hardback (there's a paperback version available), (d) Link Arms With Toads! and (e) The Coandă Effect. Next month (or the month after) may see the publication of yet another book, Sangria in the Sangraal. And later in the year it's possible that I might have two more books out: Tallest Stories and The Impossible Inferno. If this does indeed happen, 2011 will be my most successful writing year ever! OK, I admit it -- I'm showing off!